What better way to see the beautiful Yorkshire countryside – the Dales, Bronte country, or the North York Moors – and enjoy a more relaxed pace of life, than to experience a Morris Minor Hire. Treat yourself to a trip down memory lane or buy a gift for someone who has fond memories of this iconic 1960s classic car. 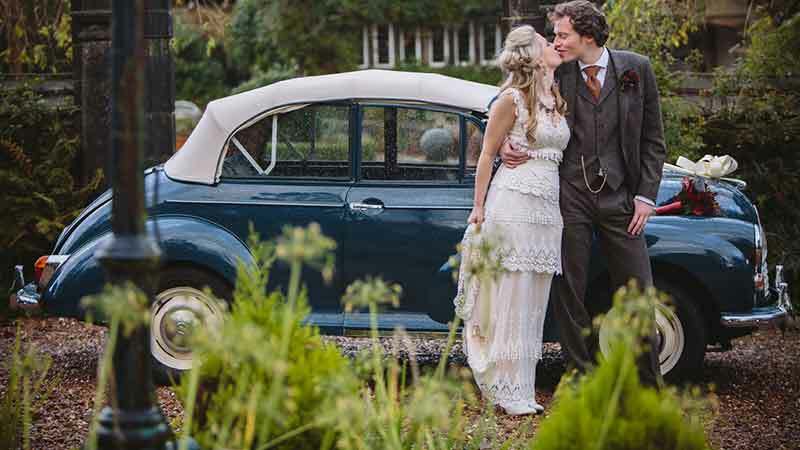 The Morris Minor makes a charming and unusual wedding car which will make people smile. It is the perfect vintage wedding car (…something blue)? We know that collection can be difficult when you’ve so much to do on the day, so have a look at the wedding package. 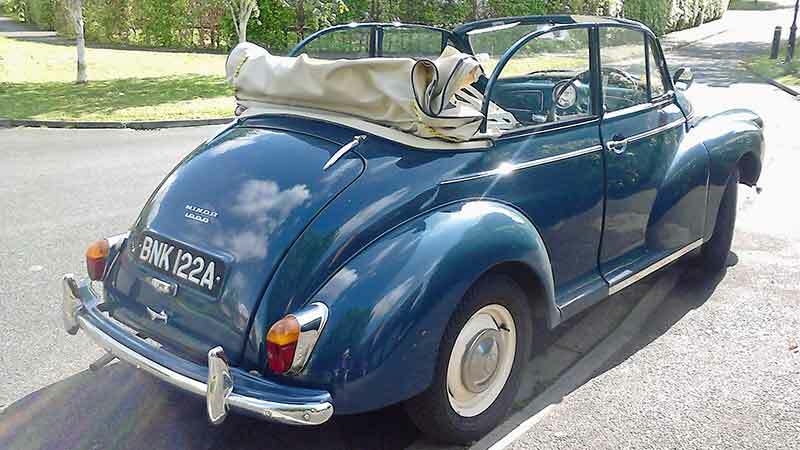 Our 1964 dark blue Morris Minor Convertible for hire in Yorkshire has a light blue interior and a cream soft top. In our opinion the best colour combination a Morris Minor can have. Our Morris Minor hire car is a full four seater with the 1098cc engine and upgraded braking system and suspension. Nearly everyone has either owned a Morris Minor, or their parents or grandparents owned one. In the 1950’s, 1960’s, and 1970s there were so many of them that it was virtually compulsory to own one at some point in your life. However, few people had a convertible, so a Morris Minor hire is your chance to find out how much better they are with the roof down! 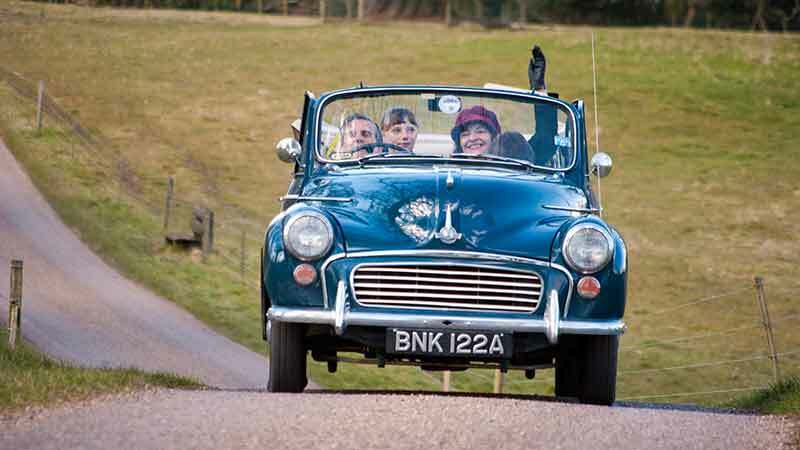 A Morris Minor hire lets you experience the enduring appeal of this much loved iconic English car, the car that marked the start of family motoring. The ‘Moggy Minor’, as it is affectionately referred to, may long be out of production, but it is still a truly cherished design classic. The Morris Minor was one of the world’s best small cars and the first British car to sell more than a million units, securing it a place in motoring history. Dubbed the ‘World’s Supreme Small Car’, by the motoring press at the launch in 1948, the demand for the Morris Minor outstripped supply. It was the first major new car of the post-war era produced in Britain, and it symbolised the country’s emergence from war time austerity. More than 1.6 million Morris Minors were manufactured between 1948 and 1972. They were exported to all four corners of the globe until production ceased in the UK at the end of 1971, the final Minor to be produced being a GPO van. Production in New Zealand continued until 1974. Saloon versions made up about 1 million of the Minors that came off the assembly line. Of the remainder about 326,000 were vans and pickups, 215,000 were Travellers, and only 75,000 convertibles or ‘Tourers’. In the late 1940’s, the Morris Minor was a relatively roomy car with excellent handling and cornering compared to competitor products. It was an economy vehicle that combined the luxuries and conveniences of a reliable motor with a price even the working class could afford. 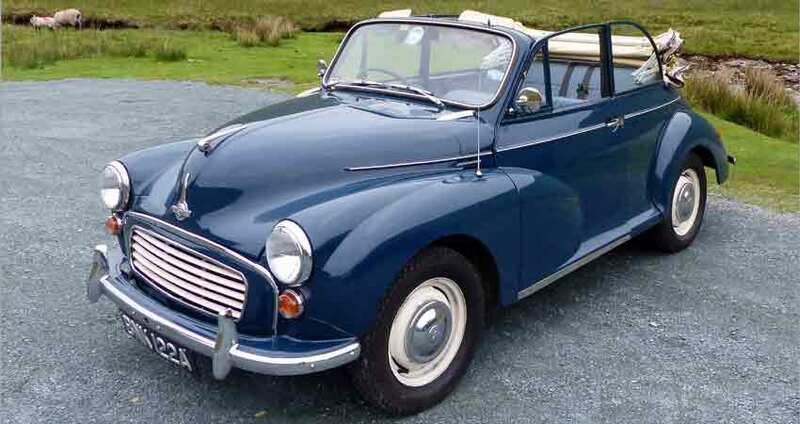 Whilst early Minors – series I and II – had an undeniable charm, the Minor 1000, introduced in 1956 with a 948cc series A engine, had the power to match the handling. The most powerful Minor 1000 with a 1098cc engine was introduced in 1962, of which our Morris Minor Hire car in Yorkshire is one. The designer of this superb little car was Alec Issigonis, who is also famous for designing the Mini. Employed by Morris Motors of Cowley, Oxfordshire he started work on his prototype for the Morris Minor, known as the Mosquito, in the early 1940s. However, Lord Nuffield, the chairman of Morris Motors, disliked its appearance and referred to it as looking like ‘a poached egg’. Issigonis himself felt it looked too narrow. So, close to the model’s launch he had it cut in half from front to back, and moved apart until he was happy with the shape. To make the car four inches wider a fillet strip was added to the centre which remained visible on the bonnet all through production. 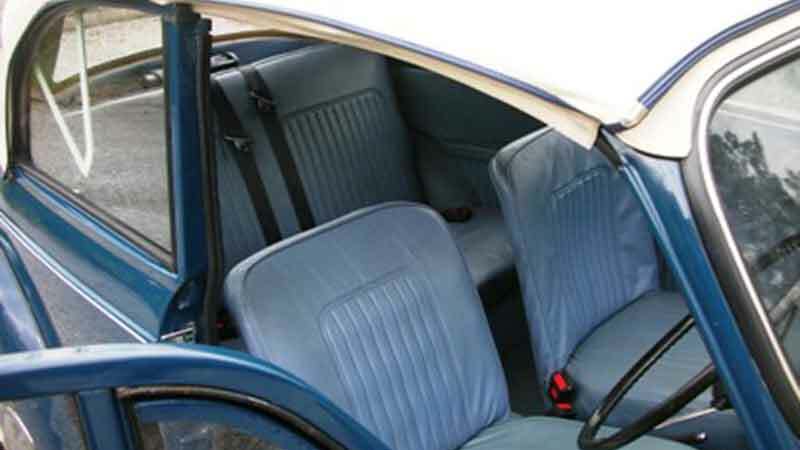 Issigonis’s design was far-sighted for its day. At a time when most steering used the old fashioned steering box, he chose rack and pinion steering for light, precise handling, with torsion bar independent front suspension for a smoother ride. He also chose a one-piece (monocoque) shell, rather than separate chassis and bodyshell. Whilst he did not invent these features, the way he combined them in the production of a budget price family saloon was ground breaking. Cars today typically use both rack and pinion steering and monocoque bodyshells. The Morris Minor was so versatile that it even saw over two decades of service in Britain’s police forces. In fact, it is said that as late as 1995 Falklands Islands police were still using their Minor 1000 saloon. Top speed 77 mph. 0-60 in 24.8 seconds. Trafalgar blue with cream hood and light blue interior. Our Morris Minor hire car is available for collection in Keighley, West Yorkshire, not far from Skipton, the ‘Gateway to the Dales’. Our location is within easy reach of all the major towns and cities in the north of England. We are in an ideal location for Morris Minor Hire Bradford, Halifax, and Huddersfield. For Morris Minor hire Preston, Blackburn, and Burnley, Lancashire you don’t have too far to travel either. We are within an hour’s drive of most of the towns in Lancashire via the M65 or A59. Manchester Morris Minor hire is within 50 miles of our Keighley base. Once you’ve collected it, you can drive our Morris Minor hire car anywhere in the UK subject to our terms and conditions.